Despite profuse official protestations to the contrary, however, Brazil’s afflictions turn out to be of its own making, as it so often proves to be the case. Looking at the set of clearly laid-out policy choices made by the Brazilian government – and the almost as clearly spelled-out political objectives underlying them – should provide enough explanatory evidence to sort out this cautionary tale for developing countries everywhere. The election of businessman Mauricio Macri to the presidency in Argentina signals a rightward turn in the country and, perhaps, in South America more generally. Macri, the candidate of the right-wing Compromiso para el cambio (Commitment to Change) party, defeated Buenos Aires province governor Daniel Scioli (the Peronist party candidate) in November’s runoff election, by less than 3% of the vote. Macri is the wealthy scion an Italian immigrant family that made its money on the basis of government contracts. He went on to work for the family business and later, defying his father’s wishes, became president of the most popular professional soccer club in the country, Boca Juniors. In 2007, he won election as mayor of the capital city, Buenos Aires—the springboard for his eventual election to the presidency. 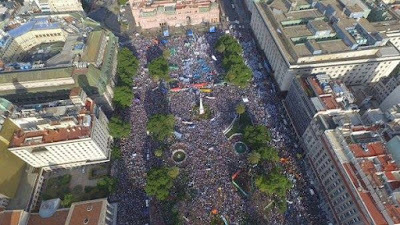 This is a momentous change in Argentina’s history, since it is the first time that a right-wing party has won the presidency by electoral means. In the past, conservatives had only gained power through military coups or by disguising neoliberal policies under more progressive electoral promises and the mantle of a left-of-center party—as in Carlos Menem’s Peronist government in the 1990s. Macri’s economic team includes among its most prominent members Alfonso Prat-Gay, an ex-president of the country’s Central Bank who also worked for JP Morgan Chase. He will be the next finance minister. Federico Sturzenegger, secretary of economic policy in the Economics Ministry under infamous finance minister Domingo Cavallo—author of the main economic policies of the 1990s—is likely to be the next Central Bank president. In other words, the economic team clearly signals a return to the market-friendly policies of the 1990s. This is also true on the foreign policy front, were Macri has already announced that he intends to use the so-called “democratic clause” of the Common Market of the South (Mercosur), the regional trade agreement, to exclude Venezuela for alleged violations of democratic norms. (Macri has backed off that plan since the victory of the right-wing coalition in Venezuela’s recent parliamentary elections.) He has also signaled a closer alignment with the United States. The economic program of the new administration is quite clear, even though Macri tried to hide his economic advisors before the election, to reduce the impact of their unpopular views at the polls. They will unify the foreign exchange market, in which there is currently a large gap between the official and black-market exchange rates. This implies a “maxi-devaluation” of the peso, from around nine to about 15 pesos to the dollar (assuming that the current black market level is their desired nominal exchange rate). The effects of a depreciation of this magnitude will be massive. In contrast to previous devaluations—most recently in 2002, after more than ten years of a fixed one-to-one peso-to-dollar exchange rate under Cavallo’s so-called “Convertibility Plan”—this one is not caused by an external crisis. While it is true that Argentina’s current account balance is negative, and that its reserves are relatively low, there is no significant danger that Argentina will default on its external debt now. The current account deficit is not big, by historical standards or in comparison to other countries in the region, and international reserves can cover the country’s immediate obligations. Besides, under current conditions, with low international interest rates, it would be relatively easy to attract capital flows with higher interest rates, and borrow in international markets. (That would certainly be easier if Argentina could finalize an agreement with the so-called “vulture funds,” the holdout bondholders that did not agree to the rescheduling of debt after the last default.) And, if anything, Macri’s (unnecessary) promise to give in to all the vulture funds’ demands and rapprochement with the United States and International Monetary Fund (IMF) would resolve any short-run problems in financing the current account deficit. The question, then, is why the Macri government would promote a huge depreciation of the currency with no clear external crisis on the horizon. The notion that the depreciation would solve the current account deficits is fraught with problems. Not only is the external situation not dire—so depreciation would be a “solution” to a non-existent problem—but there is also no evidence that exports will boom after a depreciation. Exports respond more to the growth of the global economy than to a change in relative prices. So for example, China will not demand significantly more soybeans from Argentina, as a result of lower prices, if the Chinese economy is not growing faster. Actually, the only significant way in which the depreciation will reduce the external problems of Argentina is by causing a recession. Depreciations tend to reduce real wages, since the increase in the price of imported goods leads to inflation, which is not fully recovered by workers. As a result, consumption declines, with a negative impact on economic growth. Macri and his economic team have been very explicit about the need for a huge devaluation and the closing of the gap between the official and the black-market (or “blue,” as it is known in Argentina) exchange rate. This has already triggered an inflationary surge, as noted by the outgoing Economics Minister Axel Kiciloff. The reason for the devaluation is precisely to cause inflation and a recession, both of which would weaken working-class bargaining power and, as a result, lead to lower real wages. And that is the ultimate goal of the new Macri administration. He has explicitly said so, in one of the videos that his campaign tried to suppress. The video shows him suggesting that the way out of the problems of the 1990s—when devaluation was not an option due to the Convertibility Plan—was to reduce real wages to increase external competitiveness. The maxi-devaluation of the peso will most likely be accompanied by a “fiscal adjustment plan” or, simply put, austerity. This would push the economy further into recession, reducing the bargaining power of workers even more. Some skeptics suggest that Macri cannot pursue the classic IMF economic package of devaluation and fiscal adjustment, since that would bring about both inflation and recession, a politically explosive combination. However, the administration will deflect political problems caused by the economic crisis that these policies will trigger by suggesting that both inflation and the recession are the results of the negative legacy of twelve years of “populism” under the previous two administrations. In fact, Macri is already doing this, with intensive media support, suggesting that the inflation since the announcement of the depreciation is just a correction to its true level. One can easily see how higher unemployment would be justified in the same fashion, as an adjustment to the true and sustainable level. In other words, the Macri government will cause a crisis that does not exist right now—though the economic situation may be difficult and growth in the last three years has not been not high—but blame the effects of its neoliberal policies on the previous government. The idea would most likely be to weather a political storm over the next couple of years and then—after resolving the issues with the vulture funds and normalizing relations with IMF—start borrowing abroad again. That would help promote growth again in time for a re-election campaign in 2019. Growth would be also facilitated by the fact that the economy would be coming out of a crisis, with real wages considerably lower and the working class well-disciplined. Also, Macri will reduce or eliminate export taxes on grain and soybeans (known as retenciones, or “retentions”), strengthening the position of the ruling elites. The reorientation of the economy toward primary-goods (agricultural and mineral) production, along with a larger role for finance, has been the strategy of the Argentine elites since the last military dictatorship. That is why there is such continuity between the economic plans of José Martínez de Hoz under the military dictatorship of the late 1970s and the early 1980s, Domingo Cavallo under Menem in the 1990s, and (one should expect) Adolfo Prat-Gay under Macri in the coming years. The initial recession and cuts in retenciones would significantly reduce government revenue and most likely lead to larger fiscal deficits. Hence, austerity will actually worsen the fiscal balance, contrary to what the Macri and his advisors suggest. The key is to remember that austerity policies are not designed to reduce fiscal deficits, even if that is offered up as a rationalization; they are a political instrument for disciplining labor. [And if it is any consolation, at least the adjustment will be done by a right-wing party, in contrast to Brazil, where the same program, essentially, is being pushed by the Workers' Party; and yet the right-wing forces are also trying to bring the left of center government of Dilma Rousseff down; more on that on another post]. In fact, the coming larger fiscal deficits will most likely be used to try to cut social welfare expenditures, which increased significantly during the administration of the outgoing president Cristina Fernández and her predecessor (and husband) Néstor Kirchner. It would not be surprising if Macri tries to privatize social security once again, something that Menem accomplished in the 1990s, and which had to be reversed in the 2000s as a result of the private system’s complete failure to provide a decent retirement for seniors. But if the Macri administration is a throwback to the neoliberal era of Menem, it is important to remember that the current historical context is very different. Back in the 1990s, the fall of the Berlin Wall and the collapse of the Soviet Union gave the neoliberal policies of the infamous Washington Consensus a status of unquestionable truth. Supposedly, ideology had vanished and history had come to an end. No alternative was politically possible. Since then, the 2008 global Great Recession has shown the world the perils of unfettered capitalism, and even if the “Keynesian moment” was brief and austerity policies have reasserted themselves, at least it is widely understood that the “free market” is no solution for the problems of development in a globalized economy. The socioeconomic situation in Argentina is also very different. Back then, the economy was coming out of two bouts of hyperinflation, a whole decade of very low growth with very high unemployment levels and very low real wages, two decades of social conflict with a considerably weakening of the trade unions, several military coups, and an unresolved human-rights crisis from the last dictatorship. Now, the economy has grown at a healthy pace over the last decade, though with slower growth over the last three years. Unemployment remains at relatively low levels, and though inflation is relatively high, real wages have still grown significantly over the decade, with a considerable reduction of inequality. Further, not only has the reorganization of the economy strengthened the working class, but civil society has managed to bring violators of human rights to justice, and finally come to terms with the nefarious legacy of the dictatorship, something unique in the region. The new government does not control congress, and the election was close, signaling a divided country. In short, society is more organized and better prepared to face the onslaught of neoliberal policies this time around. * Forthcoming in the January/February issue of Dollars & Sense (subscribe; the other contributors are actually good). A version of my talk at the Universidad Nacional de San Martín (UNSAM) last month. "I anticipate continued economic growth at a moderate pace that will be sufficient to generate additional increases in employment, further reductions in the remaining margins of labor market slack, and a rise in inflation to our 2 percent objective." "As you know, there has been considerable focus on the first increase in the federal funds rate after nearly seven years in which that rate has been at its effective lower bound. We have tried to be as clear as possible about the considerations that will affect that decision. 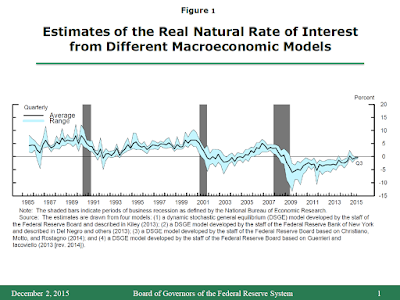 Of course, even after the initial increase in the federal funds rate, monetary policy will remain accommodative." So they will increase, but slowly. 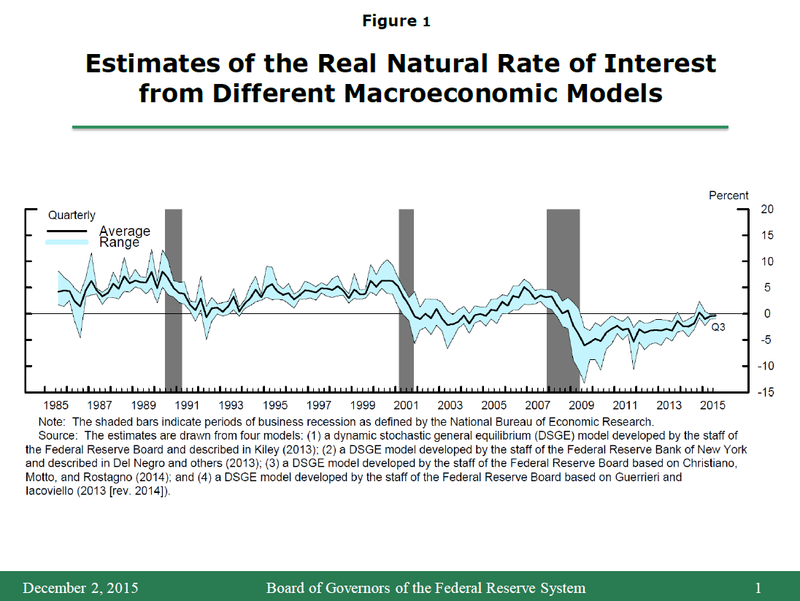 On a more theoretical note, if you doubt the actual relevance of mainstream neoclassical economics for policy decisions, the whole thing is informed by what the Fed refers to as the neutral interest rate, which is according to Yellen "a concept closely related to the... 'natural' rate of interest" (Figure above shows the staffs calculations). Alan Blinder says the rate will, eventually (he says in 3 years), reach 3.5%. I wrote too much on the problems of the concept of a natural rate of interest to repeat myself. Oh well.